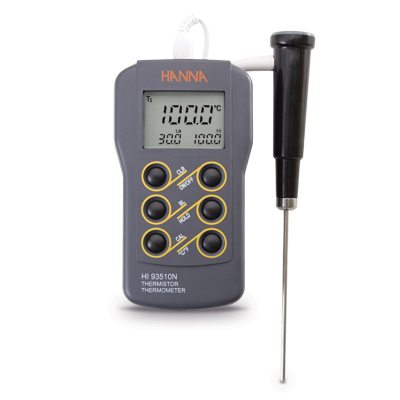 HI 93510 is a waterproof thermometer tailored for the lab and field. The LCD displays the highest and lowest readings in the cycle along with the current temperature. To freeze the reading for easy recording, simply press the HOLD button. Celsius or Fahrenheit range can be selected at the touch of a button. HI 93510 is supplied with HI 762BL temperature probe, batteries and instructions.